Professor of Music David Becker works his baton for the last time as conductor of the 102-member Lawrence Symphony Orchestra at its concert Saturday, May 26 at 8 p.m. in the Lawrence Memorial Chapel. The concert is free and open to the public. Becker, who has served as director of orchestral studies at Lawrence since 2005, is retiring at the end of the current academic year. Becker says each time he’s taken the stage with the orchestra over the past seven years has been a career highlight for him. 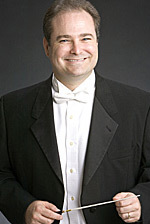 Becker, recipient of Lawrence’s Award for Excellence in Teaching at the college’s 2010 commencement, plans to dedicate his post-Lawrence time to guest conducting, workshops and clinics around the country, including leading the NAfME All-International Honors Orchestra in the Kennedy Center in Washington, D.C. in June. Saturday evening’s concert program will feature works by Debussy, Paulus and Tchaikovsky. Senior Daniel O’Connor, organ, the co-winner of the LSO 2011-12 Student Concerto Competition, will be the concert’s guest artist. It’s perfectly understandable if Rodrigo Ruiz is just a tad nervous these days. After all, it’s not every day someone makes their professional conducting debut while still a student. The Lawrence University senior will lead the Mexican Orchestra of the Arts Sunday, Feb. 6 in an all-Beethoven symphonic concert in Mexico City’s most prestigious concert hall, the 2,300-seat Sala Nezahualcóyotl. Ruiz, who grew up in Baja California and now makes his home in San Diego, will conduct the professional orchestra in performances of Beethoven’s Leonore III Overture, the Emperor Piano Concerto, with guest pianist Mauricio Náder, and the Fifth Symphony. A piano performance major, Ruiz has taken conducting tutorials with David Becker, Lawrence director of orchestral studies, since his sophomore year. He spent the 2009-10 academic year as the student assistant conductor of the Lawrence Symphony Orchestra. Ruiz was chosen for the guest conducting position through a cultural program run by the state of Baja California based in part on video footage he submitted. The program is designed to assist talented young artists with their career development and is modeled on Venezuela’s “El Sistema” program, which has produced such talents as Gustavo Dudamel, currently the principal conductor of the Los Angeles Philharmonic. Ruiz is approaching the concert with the goal of making a meaningful connection with his audience, which will include his parents. “My job as a conductor is to present myself just as a metal would conduct electricity so that this beautiful music written by these great composers can flow through me and reach the essence of the audience,” said Ruiz, who began rehearsals with the orchestra on Tuesday in preparation for Sunday’s concert. Mexico City's Sala Nezahualcóyotl concert hall features seating behind the orchestra as well as in front. Four members of the Lawrence University faculty were recognized for teaching excellence, scholarship and creative activity Sunday, June 13 during the college’s 161st commencement. David Becker, professor of music and director of orchestral studies, received Lawrence’s Award for Excellence in Teaching, which recognizes outstanding performance in the teaching process, including the quest to ensure students reach their full development as individuals, human beings and future leaders of society. Becker returned to the Lawrence conservatory in 2005 as director of orchestral studies after serving in the same capacity for four years early in his career in the mid-1970s. In between he held teaching positions at Oberlin College, the University of Miami and UW-Madison, where he spent 21 years as director of orchestras and professor of the graduate orchestral conducting program. A native of Pennsylvania, Becker earned a bachelor of music degree in viola performance and music education at Ithaca College School of Music and a master of music degree in viola performance and conducting from the University of Louisville School of Music. Jerald Podair, professor of history and Robert S. French Professor of American Studies, received the Award for Excellence in Scholarship, which honors a faculty member who has demonstrated sustained scholarly excellence for a number of years and whose work exemplifies the ideals of the teacher-scholar. A specialist on 20th-century American history and American race relations, Podair joined the Lawrence faculty in 1998 as the winner of that year’s Allan Nevins Prize, an award conferred by the Society of American Historians for the best Ph.D. dissertation in history written in the country that year. His current scholarship includes a baseball-themed book on the cultural implications of the Brooklyn Dodgers move to Los Angeles, a book that looks at the United States from 1877 to the present entitled “American Conversations” and a collection of essays on the ways Americans have sought to define the concept of equality. A native of New York City, Podair serves as a member of the Wisconsin Abraham Lincoln Bicentennial Commission and was named a fellow of the New York Academy of History in 2009. He earned a bachelor’s degree at New York University, a law degree from Columbia University and his Ph.D. from Princeton University. Patrice Michaels, professor of music, received the Award for Excellence in Creative Activity. Established in 2006, the award recognizes outstanding creative work for advancing Lawrence’s mission. An award-winning soprano, Michaels has taught vocal performance and music theatre in the Lawrence conservatory since 1994. A specialist in the works of Mozart, Michaels has performed at prestigious concert venues throughout the world, including Salzburg, Austria in 2006 for the 250th anniversary celebration of Mozart’s birth. She is well known for her performance of “The Divas of Mozart’s Day,” a tour de force theatrical production that celebrates the divas of late 18th-century Vienna. She has released 20 commercial recordings, among them the disc “American Songs,” which included eight world premiere recordings. In a career that has taken her to opera stages around the world, Michaels also has performed for the U.S. Supreme Court and Cuban President Fidel Castro. Most recently she has remounted an original program she first developed while at the Banff Centre for the Arts. “A Song for Harmonica,” featuring a 4-foot tall bib overall-clad puppet worked by Michaels, is a program designed for elementary school students to explore the nature of inspiration through operatic excerpts and original songs. Michaels earned a bachelor’s degree in music and theatre from Pomona College and a master of fine arts degree from the University of Minnesota. Dominica Chang, assistant professor of French and Francophone studies, received Lawrence’s Young Teacher Award in recognition of demonstrated excellence in the classroom and the promise of continued growth. A member of the Lawrence faculty since 2007, Chang’s research interests include 19th-century French studies, literary history and historiography, print culture, film studies and language pedagogy. “Students speak with enthusiasm about your ability to inspire everyone to learn and reach the highest levels of achievement,” said Burrows. “Your patience and warmth help students conquer their anxieties about writing and speaking and produce work of outstanding quality. Your feedback is frequent and helpful. “Students say they strive to do well because they want to repay the trust you show in them and many give you the ultimate praise: you are the best professor they have ever had,” he added. Chang earned a bachelor’s degree in French language and literature from UW-Madison, a master’s degree in French studies from Middlebury College and a Ph.D. in Romance languages and literatures from the University of Michigan. She also spent a year studying at the University of Paris.